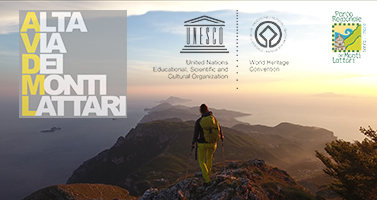 Since 1997 the Amalfi Coast is inserted between the sites of the UNESCO World Heritage List and this recognition, linked to its uniqueness in terms of identity, artistic and cultural environment makes the navel of the entire Mediterranean Sea basin. The Amalfi republic was called the most prosperous, noble and illustrious city of Longobardia “… here they lived the best navigators of the time and when they came merchants from all parts of the known world ….” At the base of his fortunes, the woods of which at that time were rich in the coastal mountains costal mountains. L’ Alta Via Dei Monti Lattari (00) is a hiking / alpinistic itinerary of these lush mountains overlooking the blue sea of ​​Amalfi, Positano, Ravello, Sorrento and Capri. The ninety kilometers of the dorsal of the Sorrento Amalfi Peninsula, called #montilattari chain, travels. Some famous travelers have called it the perfect blend of seas and mountains . A discovery in every point of the territory that will always make the same view different with the blue of the sea, with the green of cultivated terraces, yellow lemons or the red of autumnal vines.